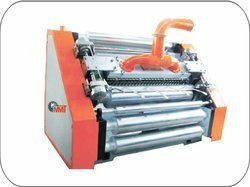 Aiming at maximum level of client-satisfaction, we are offering Corrugation Machines which is manufactured strictly as per the specifications of our clients. These machines are highly reliable for longer service life and gives and excellent performance. We tested these machines with the help of our diligent quality auditors in order to ensure their flawlessness and greater operational efficiency. Our range includes Corrugation Single Face Paper Corrugating Machine, Oblique TypeCorrugating Machine, Double ProfileCorrugating Machine.For Better understanding of our customer we have given alternate names of the products also. One Set of ‘Broad’ flute roll. S.Steel Tube heaters ½” Thickness of 9 K.W Each. Drive reducer box, oil immersed type lubricating to reduce noise keep running stable adopt transmission separate power. Corrugating roller pressure roller and glue roller by pneumatic adjustment. Glue parts auto supply glue circularly. The upper - lower corrugating rollers are made of 52CrMo high-quality alloy steel after heat - treatment. The glue part surface is treated by special mesh and chrome plated. Suitable for converting paper into corrugated 2ply rolls. 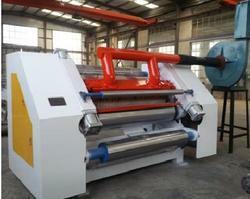 The machine is fitted with two sets of flute rolls, self-loading reel stand with reel shaft. Can be used for converting paper into corrugated 2ply rolls. Gimbal drive, separation structure, independent drive box, enclosed gear oil immersion type lubrication, can prolong the life of the gearing. Corrugated roller adopts 48CrMo high-quality alloy steel, quenched and tempered, hardened, polished surface, corrugated dia 280/270 mm, surface hardness HRC60 degrees; Adopt pneumatic cylinders control up and down of corrugated roller. Pressure roller diameter 280/270 mm, modulation processing with 45# carbon steel, machining and grinding off the surface chrome plated cylinder control up and down. Pneumatic control supply glue, glue roller diameter Ø215 mm, engraved with the pit-style textured back surface polished, hard chrome plated, doctor roller surface grinding and hard chrome plating. 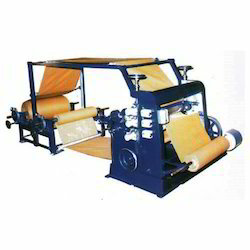 The Vertical Type Single Face Paper Corrugating Machine, offered by us, is highly suitable for converting the paper to corrugated 2 ply rolls. 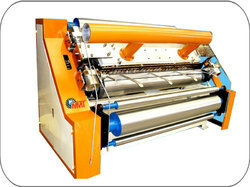 It is fitted with advanced two set of flute rolls in order to ensure operation of next roll within 10 minutes. With the help of diligent professionals, we manufactured it using ultra-grade raw material. In our world class quality testing laboratory, it tested on different parameters in order to ensure its flawless functionality at the clients' end. (Bearing model is available in 100 feet 135 feet & 150feet per min). 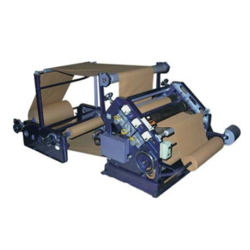 Size 42 " 45" 52 " 62 "
Suitable for converting paper into corrugated 2ply rolls.The machine is fitted with two set of flute rolls, self loading reel stand with reel shaft. Suitable for converting paper into corrugated 2ply rolls. 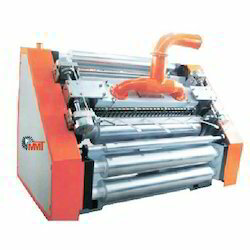 The machine is fitted with two set of flute rolls, self loading reel stand with reel shaft. l Vacuum suctiontypepulling cardboard with wind control device. l Gluing roller and doctor roller are designed to groups guideway slippage load-unload, convenient and swift. l Upper flute roller, pressure roller, gluing roller move by pneumatic. l The bearing of flute roller and pressure roller adopt high temperature resistant lubrication grease. l Glue amount control through adjust the gap between gluing roller and doctor roller by motorized control (or manual control option). l Adopts 48CrMo high quality alloy steel, with heat treatment, hardness HRC50-55, surface do ground finish and hard chrome plated.